Lung cancer is a disease of abnormal growth of the cell in the lung, which can easily travel to other organs of the body and become deadly . It is a most common reason of death in the United States . Primary lung cancer develops in the lungs and metastasizes to the lungs, lymph nodes, bone, brain, liver, and adrenal glands. Secondary lung cancer travels from another part of the body or metastasized to the lungs. Most common primary locations are the colon, kidney, breast, skin, eye, and prostate . There are multiple treatment options have become available for lung cancer patients over the last two decades. New surgical treatment like video-assisted thoracic surgery has shown good results in early recovery and reducing pain . Moreover, advancement in the radiotherapy and targeted molecular therapy have shown good results not only in elderly but also in young patients and improved outcomes in lung cancer patients . Lung cancer is primarily an old age disease, and the incidence of lung cancer significantly increases with age [6-8]. It commonly identified among people above the age 60. In addition to age, there are lots of other factors which play a significant role in the selection of the right treatments. Old age patients may have more comorbidities and so have limited options for the procedures [9-11]. During the last decade, lung cancer mortality has declined due to early diagnosis and treatment advancements [12,13]. However, it is difficult to predict the outcome for secondary lung cancer; it depends on the origin of the primary tumor and its malignancy treatment. Secondary lung cancer can be completely removed with surgery, if the primary site is kidney, bladder, colon or any soft tissue . This report utilized the Health Cost Utilization Project’s (HCUP’s) Nationwide Inpatient Sample (NIS) database, to get a better quantitative idea of the trends in treatment procedures especially about hospitalized secondary lung cancer patients. HCUP family of databases consisting of ambulatory care, acute care and emergency department patient stays (among others) is the creation of a Federal-State-Industry Partnership with AHRQ. The NIS database is part of the HCUP and contains data from 8 million hospital stays each year and shows 20% stratified samples of United States hospitals. This study utilized the NIS data from 2003 to 2011 primarily for the review of trends in lung cancer (both malignant and benign) treatments as also other hospitalization outcomes such as Length of Stay and Total Charges . Patient discharges were selected based on principal diagnosis code (ICD 9 code of '197.0'). The set of principal procedures of those patients classified into three categories (open surgery or Open procedure, Non-surgical procedures, and others). The Open procedure represents wedge resection, segmental resection, lobectomy, and pneumonectomy. The Non-surgical procedure represents chemotherapy, radiation and injecting of the therapeutic substance. The Other procedure represents invasive mechanical ventilation, insertion of the vascular device, photodynamic therapy, encounter therapeutic and hospice, etc. Figures 1 and 2 below shows the extraction process with numbers obtained for the procedures from the total number of discharges. Figure 1: Extraction of Study Patients and Procedure. Figure 2: Extraction of Procedural Types. There were only a few inconsistencies or missing data found in the extracted data set. Discharges with missing data were left out from the analysis. If however, the missing data was the admission type (A Type) it was replaced using admission source (A source) on the following basis. Missing admission type is set to emergency if admission source is emergency, to urgent if admission source is critical care. Discharges with missing principal procedures excluded from the analysis. Statistical Analysis was conducted using SAS and Excel. Most commonly used statistical methods were Analysis of Variance (ANOVA using Proc GLM), Chi-Square (Proc Freq) and Simple Regression (Proc REG/Proc GAM). A p-value of <0.05 considered as statistically significant. Figure 3 shows the trend analysis results: the open procedure is gradually trending in an upward direction (Linear regression slope 0.07; P-value <0.0001) while the Non-surgical (Linear regression slope -0.07; P-value 1.00) and Others procedure (Linear regression slope -0.014; P-value 0.16) remain constant. There are two noticeable drops in slope in 2009 and 2011. 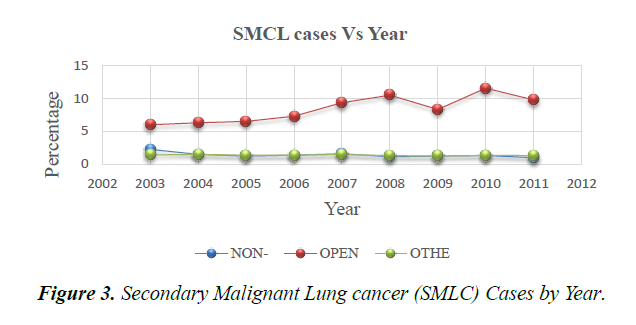 Figure 3: Secondary Malignant Lung cancer (SMLC) Cases by Year. Figure 4 shows that the Mean patient age over time for the open procedure is in an upward direction (Linear regression slope 0.25; P-value 0.0001), while the mean age for Non-surgical (slope 0.020; P-value 0.8) and others (slope -0.20; P-value 0.17) are relatively constant. Figure 4: Mean Age by Year. 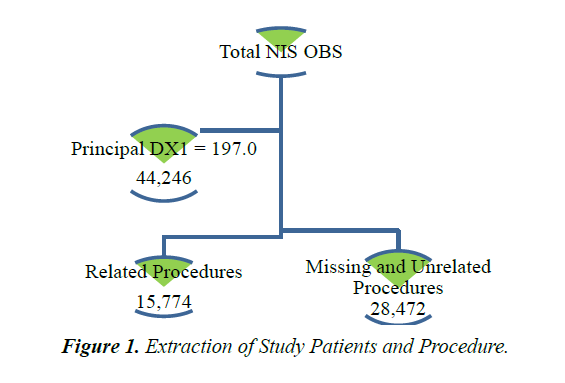 Table 1 shows no of patients for the Open procedure (10070; 75.45%) were more as compared to Non-surgical (1655; 12.39%) and Other procedures (1621 12.14%). The mean age for other procedures (61 years, with 971(59.90%)/female and 650(40.10%)/males)) was higher than both Open (56 years, with 4767(47.63%)/female and 5274(52.37%)/males) and Non-surgical procedure (58 years, with 934(56.44%)/females and 721(43.56%)/males)). No. of females were more in all procedures (56% non-operative; 59% others) except Open procedure (48%). Table 1: Procedure and patient distribution chart. Figure 5 shows that the Mean LOS over time for the Open procedure is in a downward direction (Linear regression slope -0.17; p-value 0.0001), Mean LOS for Non-surgical (Linear slope -0.03; P-value 0.6) and Other procedures (Linear slope -0.13; P-value 0.13) are relatively constant. Figure 5: Mean Length of Stay by Year. 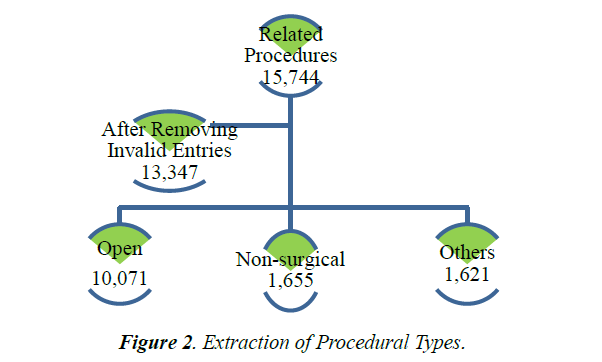 Figure 6 shows that the Mean Total Charge overtime for the Open procedure, Non-surgical and Others are all in an upward direction (Linear regression slope 1501; p-value <0.0001, Linear regression slope 2554; p-value 0.0001, Linear regression slope 4424; p-value <0.0001). Figure 6: Mean Total Charge (in dollars) by Year. *LOS:Anova Bonferroni adjustment P values <0.0001 for all combination. * TOTCHG: Anova Bonferroni adjustment P values 1.00 for all combination except (other vs. open procedures p-value <0.0001) and (other vs. Non-surgicalp-value <0.0001). Figure 6 and Table 2 revealed the following characteristics. The mean length of stay for Non-surgical and Other procedures are higher (9, 8 days) than Open procedure (5 days) .Over the period, the mean length of stay decreased from 6(days) to 4(days). The mean Total Charge for the Open procedure and Other procedure ($41,658.60; $65,715.11) were higher than Non-surgical procedure ($40,822.81). The mean Total Charge for the Open procedure has shown a noticeable increase from $30,607 in 2003 to$ 51,656.64 in 2011. Table 2: Demographic characteristics of study patients vs. procedures. As per insurance types used by the patients, 50% of patients went through the Open procedure on Private insurance; 41% of patients went through the Non-surgical procedure again on Private Insurance of private payer; 38% of patients went through Other procedure again on Private Insurance. Looking at admission sources, 90% of a patient admitted via elective admission for the Open procedure; 20% of a patient admitted via elective admission for Non-surgical; 10%of patients admitted via elective admission for the Open procedure. Table 3: also reveals that patients with extreme severity category of Risk of Mortality (507(31.55%)) treated under other procedure. Patients with minor and moderate severity (5337(53.46%), 3795(38.01%)) treated with Open procedural surgery. Among all kind of procedures, Open surgery is the most efficient procedure for lung cancer patient regarding removing the tumor from the affected the area of the lung. The type of treatment a patient receives depends on age, type of tumor, stage of cancer and the medical history of the patient. Research has already shown that survival rate after surgery is five years for a lung cancer patient . The increase in open surgery volume throughout 2003 to 2011 indicates the advances in the multi scientific areas of imaging, epidemiology and molecular pathology which has impacted not only the treatment but also the early detection and prevention of lung cancer [16,17]. Risk of mortality plays an essential role in selection of the treatment. Open procedure is not an option when cancer diagnosed at the last stage or tumor is too large. The results show that the majorities of patients undergoing open surgery are having only a minor severity level and those with extreme severity go for non-operative or other procedure options. Age is an important deciding factor for lung cancer treatment. Surgery is more suitable to young age less than 70. 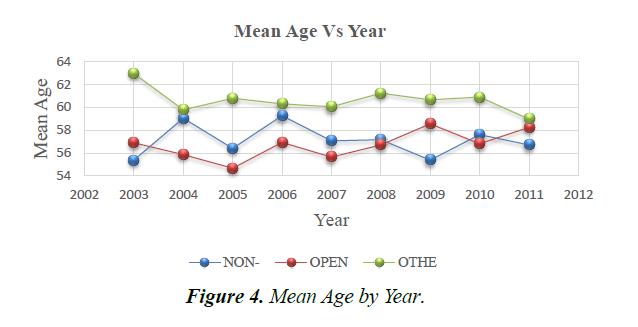 Table 3 shows that the mean age for open surgery is lower and remains constant for nine years (Figure 4), also indicates that operation is more useful for early age of patients. Old age patients may have a more coexisting medical condition or conditions, which will make them unsuitable candidates for open surgery [6-11]. In general, the risk of developing lung cancer is higher in women than men. However, they both share the same risk factors [17,18]. Table 3 shows more females are suffering from lung cancer than males, but more men are undergoing Open surgery procedures than women. There are many deciding factors involved in the choice of the right treatment. It could be possible that due to genetic differences, lung cancer symptoms are more prominent and detectable earlier in males than females at an early age. Research has also shown that secondary lung cancer produces more symptoms in men than women and thus is easy to detect in the first stage of lung cancer while it spreads quickly in the women [6,18-20]. But this result is unclear in this work and further research is required. Table 3 also shows that the overall incidence and treatment rate in each category is significantly higher in Whites as opposed to other ethnicities. Also, the majority of patients undergoing Other procedure are having Medicare insurance while those patients undergoing Open and Non-operative procedures are having private insurance. It may be because Medicare is more likely for older age people. Table 3 also shows that the mean age for Other procedure is higher than Open and Non-operative procedures. The increasing trend of total charge may not due to the specific procedure employed but may be due to the overall economy. Because hospitals need to battle with other purchasers, labor, goods, and services they don’t have full control over the economy . It is a retrospective study and so limited to data availability while a prospective study would be more helpful in yielding desired associations and test predictions based on retrospective analysis. The data is only for inpatient discharges and doesn’t include ambulatory and emergency department discharges which might generate more comprehensive information about the nature of lung cancer patients and their treatments. These data represents a portion of the annual procedures, but the data do estimate the trends. In the inpatient domain, Open procedures (specifically wedge resection) more often performed than other two types of procedures. Total charges increased for all procedures and length of stay reduced for open surgery over the period. Gender, admission type and risk of mortality are seen to play a significant role in the selection of the treatment. Lemjabbar-Alaoui H, Hassan OU, Yang YW, et al. Lung Cancer: Biology and treatment options. Biochimica et biophysica acta, 2015;1856:189-210. Mao R, Chen T, Zhou F, et al. The burdens of lung cancer involved multiple primary cancers and its occurring patterns-SEER Analysis between 1973 and 2006. Scientific reports, 2017;7:6451. Popper HH. Progression and metastasis of lung cancer. Cancer metastasis reviews, 2016;35:75-91. Ikeda N, Saji H, Hagiwara M, et al. Recent advances in video-assisted thoracoscopic surgery for lung cancer. Asian Journal of Endoscopic surgery, 2012;10:111. Chang JY, Senan S, Paul MA, et al. Stereotactic ablative radiotherapy versus lobectomy for operable stage I non-small-cell lung cancer: a pooled analysis of two randomized trials. Lancet Oncol. 2015;16:630-7. Blanco JA, Toste IS, Alvarez RF, et al. Age Co morbidity, treatment decision and prognosis in lung cancer,Age and Ageing. 2008;37:715-8. Venuta F, Diso D, Onorati I, et al. Lung cancer in elderly patients. Journal of thoracic disease, 2016:S908-14. Dela Cruz CS, Tanoue L T, Matthay RA. Lung Cancer: epidemiology, etiology, and prevention. Clinics in chest medicine, 2011;32:605-44. Jorgensen TL, Hallas J, Friis S, et al. Comorbidity in elderly cancer patients in relation to overall and cancer-specific mortality. British journal of cancer, 2012;106:1353-60. Very Well Health: “Lung cancer in old adults”, 2018. Tas F, Ciftci R, Kilic L, et al. Age is a prognostic factor affecting survival in lung cancer patients. Oncology letters, 2013;6;1507-13. Weir H K, Thompson TD, Soman A, et al. The past, present, and future of cancer incidence in the United States: 1975 through 2020. Cancer, 2015;121:1827-37. Berkeley Wellness : “Cancer Deaths Declining in U.S”, 2018. HCUP Nationwide Inpatient Sample (NIS). Healthcare Cost and Utilization Project (HCUP). Retrived from : Agency for Healthcare Research and Quality, Rockville, MD. 2011. Shen H, Cao Y, Li X, et al. Surgical Intervention Improves Survival for Metastatic Non-Small Cell Lung Cancer Patients. Medicine, 2016;95. Lungevity foundation: “Recent developments in the early detection of lung cancer”, 2018. Blandin Knight S, Crosbie P A, Balata H, et al. Progress and prospects of early detection in lung cancer. Open biology, 2017;7. Harvard Health Publishing: "Lung cancer in women", 2018. Barrera-Rodriguez R, Morales-Fuentes J. Lung cancer in women. Lung Cancer (Auckland, N.Z.) 2012;3:79-89. Geoffrey CK, Mimi K, Julie RH, et al. Body Mass Index and waist circumference in relation to lung cancer risk in the women’s health initiative, American Journal of Epidemiology, 2018;168:158-169. Health Affairs: Why Do Hospital Costs Continue To Increase? 2018.